The phrase 'tree climbing lions' seems a little bizarre to those who have never seen this unusual behaviour. Even seasoned animal behaviorists agree that lions are not evolutionarily adapted to scale trees and perch atop branches. In fact, this phenomenon is so rare that there are only two documented populations of tree climbing lions on the planet have been noted. While a leopard sleeping lazily in the treetops is a common sight on safari in the bush, this strange behaviour exhibited by lions has been the subject of interest and wonder. One of such group of rebel lions is found tucked deep in Queen Elizabeth National Park in Ishasha, Western Uganda. The other population of the elusive tree-climbing lions can be spotted around Tarangire National Park and Lake Manyara Game Reserve in Southern Tanzania. Both of this countries are in East Africa, although there have been a few sightings on a South Africa safari of the lions in Kruger National Park exhibiting a similar affinity towards tree. Lions are believed to climb trees as a behavioral adaptation to protecting themselves from the constant irritation insect bites while lazing on the ground under trees. Some animal behaviorists claim that these lions have perfected the art of climbing trees as a way of escaping the sweltering heat on ground level. This way, they can enjoy a cool breeze and blissful nap without worrying about the happenings on the ground. Moreover, this position is an excellent vantage point from which to observe the movement of prey as they cross the plains in search of grazing opportunities and water. While lions are not physically adapted to climbing trees, these distinct groups have been able to master this skill over time and teach their young to do the same; a great example of learned behaviour as opposed to natural instinct. Lions can weigh between 250 to 400 pounds so it’s no easy feat to lug their bodies up such heights. 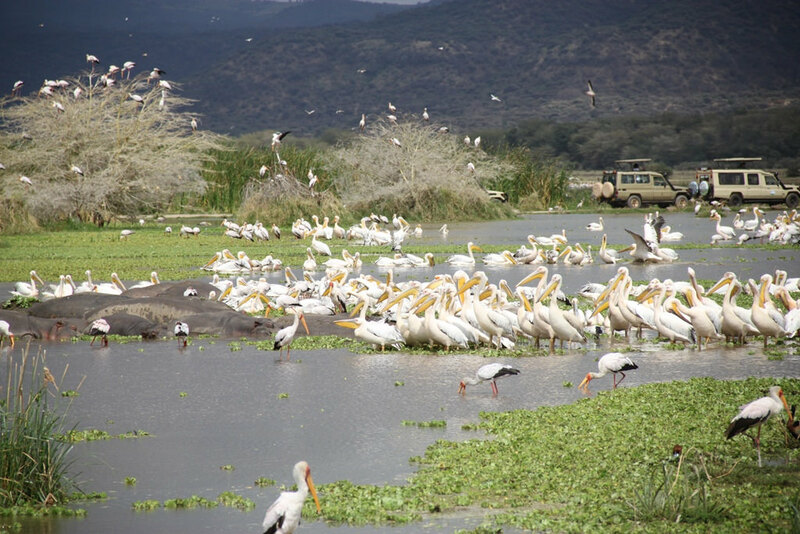 A visit to Lake Manyara Park in Tanzania or Ishasha In Uganda will not only reward you with the scenic views of the picturesque landscape but also with a chance to stumble upon the population of the exceptional tree-climbing lions. For example, in Ishasha, the lions can be seen atop huge fig tree branches as they keenly a herd of peacefully grazing antelopes, gazelles, and impalas. These herbivores form the main prey of these tree-loving lions. If you're lucky enough, you may catch the rare spectacle of a lion gingerly and carefully moving around a tree branch before pouncing on the ground. The awkward, almost unnatural hesitance which it exhibits is in sharp contrast to the flawless agility and ease that a leopard's movements demonstrate. Whether these lions choose to climb the trees to get a panoramic view of the surrounding escarpments in Ishasha and Manyara or do so to avoid the irritation from ground level bugs such as the tsetse flies, one thing remains clear. The art of effectively scaling trees - especially for older lions - calls for a measure of effort, constant practice and excellent arboreal mastery. Fortunately, like any skill that is hard to perfect, the more these lions climb the trees, the more adept they become at it.